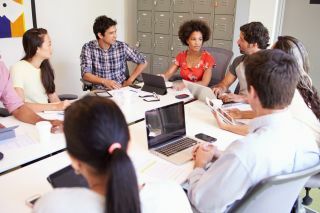 IT teams need to collaborate and communicate with other departments within an organisation effectively to be successful. With enterprise IT teams needing to stay current with new technology, and employees pushing BYOD agendas, it’s easy to see why organisations are experiencing collaboration complexity and technology overload. The role of enterprise IT teams has evolved dramatically, and includes workforce effectiveness, security, compliance and productivity. In the era of digital transformation this means that the role of IT encompasses new challenges which can impact how organisations approach their Unified Communication & Collaboration (UC&C) strategies. A recent study conducted by Frost & Sullivan division Stratecast, found that more than 80 percent of respondents confessed using non-approved software-as-a-service (SaaS) applications in the workplace. This means that a growing number of employees are communicating and collaborating across multiple, non-secure devices and applications, in addition to company-provided technology. Adopting the right mixture of technology, whilst maintaining strict security measures can seem like a daunting task for enterprise IT teams. These teams can easily be drawn to vendor hype and by those that promise to enable unachievable employee productivity to support business growth, but don’t deliver the right level of service to support these ambitions. Ensuring that your technology partner has the right organisational, scalable, and strategic fit for employees and the enterprise is critical. Before your organisation gets caught in collaboration complexity tool overload, consider these steps to ensure your UC&C strategy succeeds. Before settling on the specific technology, it’s important to stay educated, so that you can ask the right questions. Staying informed about new technology advances isn’t just about reading your favourite blog, discussion board or trade magazine. To fully understand why your organisation needs a new tool or approach, or before pulling the trigger on replacing legacy technology, you need to stay educated on how the latest technology can help the various lines of business, and then gain a holistic view of the marketplace to address that business need. This step is important, so that you’re not just looking to keep up with every piece of technology that hits the market, but deciding which ones are the most important to your company. It’s important to understand the unique collaboration mix within your organisation and to ensure the tools employed are relevant and efficient to your user base. This starts by understanding your employee pain points to determine exactly how technologies can be strategically beneficial to the organisation. It’s a question of what is working and how can you can make their lives easier? It's also important to know if there are unique scenarios for each department, and to understand how implementation of new technology may be beneficial for one team and have no direct impact on another. Each organisation, department and team member has a unique collaborator profile, so it’s important to ensure your teams aren't being overloaded with tools that are unnecessary, irrelevant or that don’t drive efficiency across your enterprise. Conference calling has been an integral part of the enterprise. Although we now have access to a range of communication technologies such as instant messaging, face-to-face video, mobile applications and more, the foundation of collaboration, the conference call, can be easy to overlook. Prioritising quality audio is a necessity as poor audio quality can make or break a meeting. A 2012 study examining the effects of hearing loss on cognition in the elderly, found that when the elderly begin to experience hearing loss, their struggle to fully understand the speech of others can drain cognitive resources that would usually be available for encoding what’s been heard in memory. The study highlights that the process of understanding speech requires additional work for your brain that would usually be devoted to tasks like problem-solving. Poor audio quality not only hampers one’s ability to communicate effectively, but it can mean participants are dealing with constant interruptions thanks to delays and difficulty determining who is speaking. Audio in conference calling can be an afterthought considering the innovative promises of other communications software, but it remains a necessary part of the modern workplace. When implementing a UC&C strategy, it’s also important to consider if the collaboration tools seamlessly fit into what we like to call a user's "inertia." In other words, how does a tool integrate into existing tools and workflows or will it needlessly overcomplicate your employees' lives? It’s important not to force employees to navigate multiple interfaces and tools to get a conference together and ensure that the new messaging piece and existing web and video technology integrates nicely together. The audio conferencing approach chosen for your organisation should offer seamless integration paths for your existing communications. After considering seamless integration, the last step for success of your UC&C implementation is engagement. When employees aren’t engaged in the UC&C technology early on or don’t understand the value to their specific work flow, they are less likely to adopt the UC approach. It’s important to provide the correct training and user adoption strategy when implementing new technology. User adoption strategy can include inviting employees to provide feedback on the new technology or hosting a Q&A session during the launch. Another strategy for promoting engagement is by encouraging employees to share successful use cases. Different department will use the technology in new ways and you can increase your ROI by inspiring teams to use the technology in different ways. Without high user adoption, operational transformation cannot happen, which means the business value cannot be achieved. IT teams can build collaboration bridges and ensure that all its organisation’s employees can easily and effectively communicate and collaborate. Whether it's a brand-new tool to market or a free app or software that employees are using on their work devices, there's never a simple fix when it comes to your UC&C strategy. To empower modern business collaboration, organisations must think of how their technology works within the context of their own people, processes and culture. It’s important for companies to shift from thinking of IT as the service provider of days’ past, to an empowered team that is making strategic business choices for the organisation and its employees.